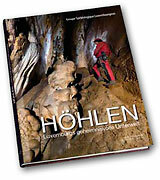 HÖHLEN - Luxemburgs geheimnisvolle Unterwelt, cover page. The photographs and the stories behind the various explorations would be sufficient to recommend this work, but it also includes exciting material on the history of the caves, their biological diversity, the tools used by the cavers during their explorations over a period of 50 years, and the geological process behind the formation of caves. Synopsis (in German): Luxemburgs Unterwelt verbirgt geheimnisvolle Orte unter Tage, Labyrinthe ohne Ende, prachtvolle Hohlräume und beängstigende Klüfte – die atemberaubende Wunderwelt der Höhlen. Spektakuläre Fotos, begleitet von spannenden Texten über Entstehung, Geschichte und Erforschung dieser Höhlenwelt machen dieses Buch zu einem einzigartigen Werk. Eine Mischung aus Abenteuer, Fakten und Anekdoten, erlebt und erzählt von kompetenten Autoren, begleitet den Leser auf einer Reise, bei der es nur ein Bedauern gibt: Endstation ist die Oberwelt! 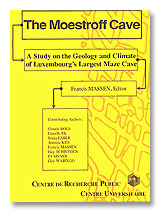 The Moestroff Cave - cover page. For over 4 years, a lot of automatic working instruments monitored different climatological parameters, as well as Radon and CO2 concentration. From the overhelming mass of data emerges a clear picture of the cave air dynamics, the short term and seasonal variations of air flow and gaz concentrations. The final report extends the scope of the research project by contributions on history, geology, hydology and instrumentation techniques from seven authors. There are only 6 items left in stock!